A day after Puducherry Chief Minister V Narayanasamy launched a protest outside the residence of Lieutenant Governor Kiran Bedi demanding sanction of govt proposals, a ruckus erupted at the site on Thursday as protests entered second day. 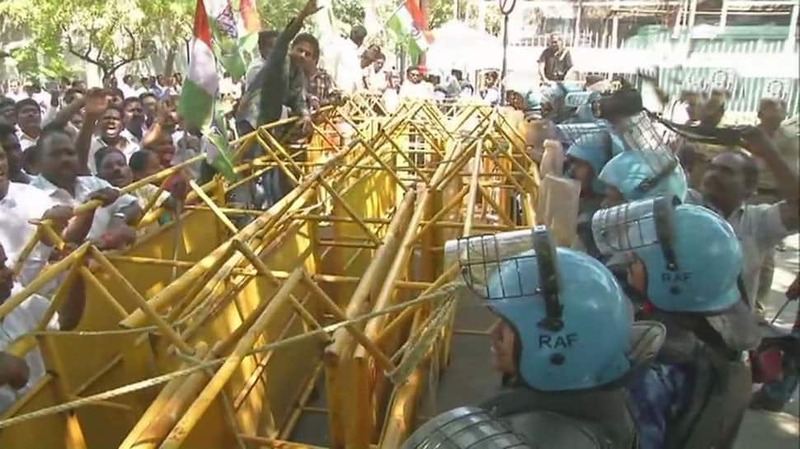 The Rapid Action Force (RAF) was called into action as the agitated protesters tried to break the barricade and jump over it. The protest by Puducherry Chief Minister V Narayanasamy and his five ministers outside Lieutenant Governor Kiran Bedi`s official residence started on Wednesday against Bedi for not permitting implementation of his government`s welfare schemes. The Congress leader his cabinet colleagues spent the Wednesday night on the road outside Raj Nivas. They slept on the road on a thick sheet and a blanket. DMK chief MK Stalin spoke to Puducherry Chief Minister V Narayanasamy and expressed his support towards him. “Puducherry CM is protesting in front of Raj Nivas against Governor Kiran Bedi. He wants the Central govt to recall the Governor,” said Stalin. Meanwhile, Bedi left for Chennai on Thursday morning to participate in an event. She is likely to go to Delhi from Chennai. Narayanasamy began his protest on Wednesday, wearing a black shirt and black dhoti. He was joined by his ministerial colleagues and DMK lawmakers. Narayansamy also accused Bedi of interfering in the day-to-day activities of the government. His protest came after Bedi hit the road two days ago and advised two-wheeler owners to wear helmets. While Bedi wanted the helmet rule for two-wheeler riders to be implemented at one go, Narayanasamy wanted the implementation in phases. On her part, Bedi on Wednesday evening wrote to Narayanasamy inviting him for a meeting on February 21. “However, I invite you for a detailed discussion on your matters on February 21 at 10 a.m. Please confirm,” Bedi said. With Narayanasamy and other ministers continuing their protest, security has been beefed up here.